I have been studying 3D animation for the past year (although I ended up mostly doing rigging) and decided to follow my passion telling me to make the switch to cfx! I am completely new to Ziva or tissue simulation of any kind, so I will definitely make a lot of rookie mistakes. These next days I am going to get started studying the software, anatomy and principles of tissue simulation and will make sure to follow the Ziva checklist and documentation, so it will probably take me a while before I am posting updates on the actual project I will be working on. For now though I have a question on how I should proceed. For my first Ziva project I would like to create a dance performance in which I can hopefully show aspects like shoulder mechanics in a dynamic format. I will be working together with local (Vancouver) dance performers who are excited to help me out with a motion capture shoot, which I can do through VFS (Beyond Capture studio, of course I will have to plan this with my animation supervisor after the summer break, this monday). The initial plan was to do this with Mr Ink since it is a great beginner asset, but I just saw that there is a student license for Max and Ada and was wondering due to the human performance nature (real proportions) of this project whether it would be a better idea to get started with either Max or Ada? Before I get started a big thanks to the incredible community and Ziva team for the great support, I am really thankful for any help, support and feedback given! Personally I think you should experiment with a simpler character like Mr. Ink first and get used to simulating at that level before trying a more complicated asset. You could adapt (warp) that anatomy to your dancing character. Thanks andy_vs , I followed your advice and started with Mr Ink. I am by no means sure if what I am doing is right so I thought I'd post an update of my first baby steps in Ziva before I progress on crucial mistakes. I used and fiddled a bit with the blendshape script originally posted by @Jake (thanks again!) and posted my take on it in that topic, I am thinking of making it ignore groups/empty transforms as well later on (I am sure this is a piece of cake to someone with experience). I was also thinking of creating some buttons to automatically set up muscles and the names of nodes once I understand the workflow a bit better. For the simulation I changed the scale a little bit so Mr Ink would be closer to 2 than 1.5 meters, I did not want to be tempted to copy values from the tutorials or demo files. I put together a setup for the triceps in the node editor and have no idea if it is anything like it is supposed to look like, it's in the screenshot below. The values are as followed "ArcLength (starting = 38.108) / 38.108 = 1" "0.8 - 1 = -0.2" "-0.2 * -1.4 = 0.38". With these values the starting excitation is 0.35, the most stretched excitation is about 0.42 and at around a 40 degree elbow bend and over it turns to 0. The lineOfAction used is that of the bicep and brachialis (should these even be on the same loa?). 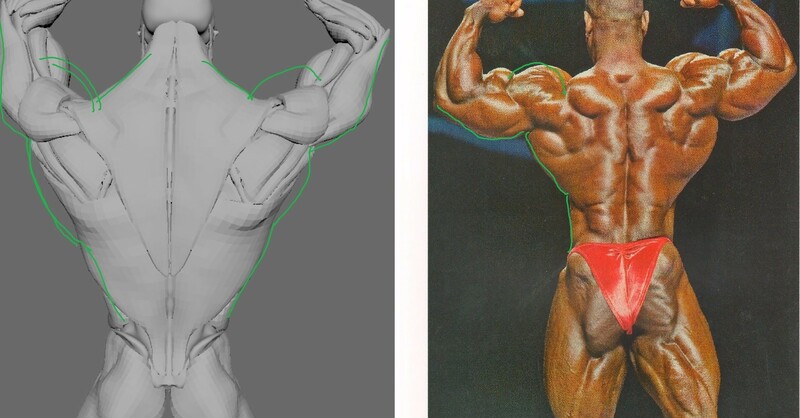 I was also wondering if for a muscle like the tricep having two heads would need two individual fiber nodes? I hope that wasn't too much of a wall of text, again I really appreciate all the help on here! Just posting an update on my progress, I haven't had too much time this week, but every second I spend with these sims I am enjoying thoroughly. I think I am entering a stage where the areas for improvement are not as obvious to me anymore, so I'd love to get some feedback! I think I went through most of the workflow basics with the result I have now. What I should definitely improve on are the elbows, probably by changing the attachment and I think the latissimus is still moving away from the body too much at the bottom. Other than that I have my doubts about many basics, for example if the muscles are balanced, if the fat reacts appropriately and if it is normal for the fat to expand in the first couple frames? The shoulder silhouette could be a bit nicer, feels flat-ish. On the pecs it's important to have the pec pull straight when the arms are out, otherwise you don't get the right shape in the skin. I realise I might not have addressed these in my own version of this asset, but none-the-less will mention here. There's some stuff to consider anyways! Thanks andy_vs , Getting notes is super helpful! I hope I tweaked it enough to address all of your notes, I know a common pitfall is being too careful with adjustments. Here is an update again, I found a fundamental mistake and had to redo most of the Fat. 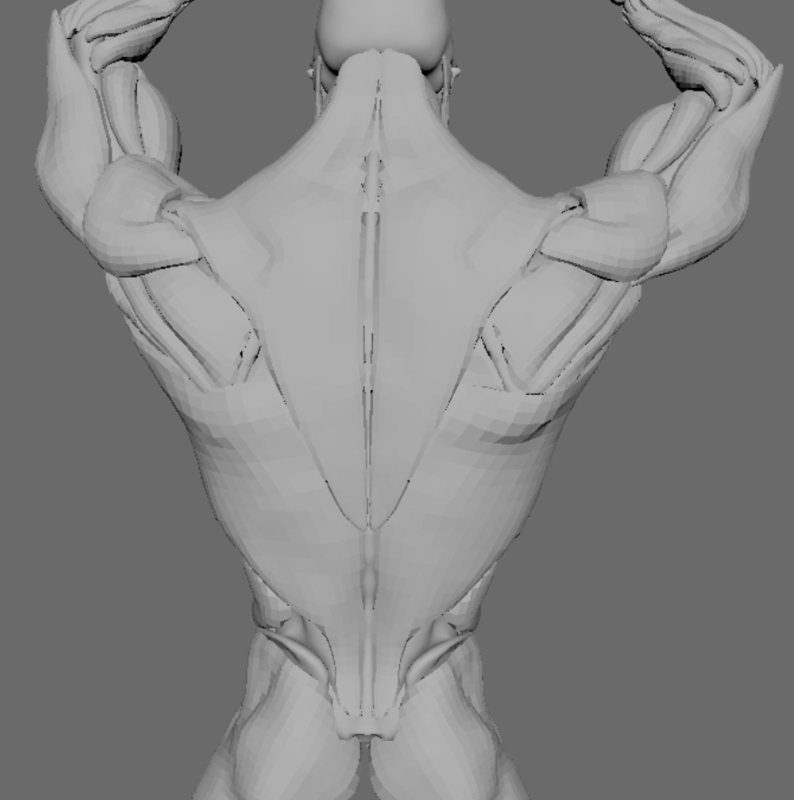 I am not happy with it yet, the bicep area feels too much like jelly to me, there is weird deformation in the area of the right scapula when the arms are raised and I think the left forearm jitters. There is a difference in the behaviour of the muscles I see now, but shouldn't exactly the right one be the correct behaviour? Hey Thomas, nice to see your updates! I just grabbed this reference to have a look a the profiles for a similar pose. This biggest differences for me are the size of the delts and the length of the traps. Are you using the same bone rig as the one supplied? And same anim? Kind of feels like the clavicles aren't being animated but could be wrong. Ah I see, I just checked and the clavicles are animated properly (same rig). This is probably just the result of me making everything too stiff, I will loosen it up a bit. Overall I should have more attention for real world reference and push it more from here on out. Here is a playblast where I solved that popping in the scapula. Another update, I am happier with the result now, especially having fixed the scapula pop and I also feel like the silhouette is more realistic. Although still the right inner elbow area collapses right at the end. On the other hand our rehearsals for the performance have been going well, and a shoot is planned for the 10th of October! I think for your next iteration, you should take the Mr. Ink anatomy and get it onto your character. We're working on tools to help this process but you can do it with the tools you have today. It will actually be the subject of the next Live with Ziva. So do you have the mocap for your dance performance yet? Ah that makes a lot of sense actually. There is a problem though, I don't have my own character and neither a modeller to work on one. I am just using whatever I can get my hands on online. What would you advise me to do? I will definitely tune in for that, it is a subject I initially wanted to tackle after this project, but the sooner the better of course! 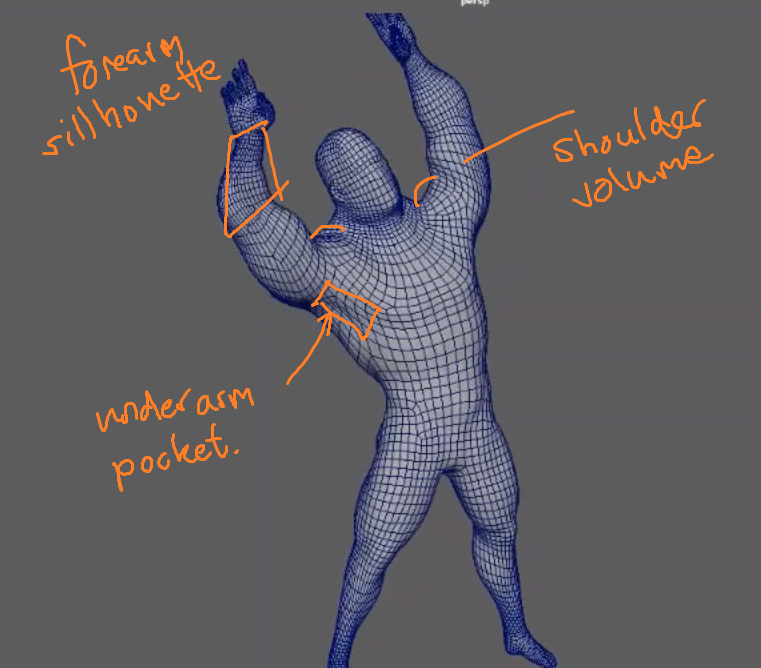 I will receive the mocap sometime after the 10th, the rehearsals we have had are purely for the choreography thus far. It would be cool if you could get a 3d scan of the actual performer. Then you're really in business. Otherwise you could get a similar proportioned character but you'll probably have to tolerate re-targeting the mocap. That would be great, I hadn't even considered it an option. Let me contact some of my friends who have more experience with 3d scans and see if it is even an option with the time and tools I have access too. The similarly proportioned character I had in mind was indeed Ada and re-targeting would go through the mocap studio. I imagine I would have to rescale the skeleton of Mr Ink to fit the performers proportions, and the rig accordingly. This I could attempt with photos this week before I have the 3D model since the mocap studio requested to deliver the rig by next week. The idea of having to retopo the body and rig the face gives me a headache in advance though. Thanks for taking the time to help me, I can imagine it being really busy with actual clients! I can totally see the value this process has in production and definitely want to dive into it soon, however the performer is not 100% sure they feel comfortable with the existence of a virtual copy of themselves which I can completely understand. Thus we decided to try to continue with Ada once that gets approved. ThomasM The idea of having to retopo the body and rig the face gives me a headache in advance though. There are a few tools that can do retopo. Zbrush and Mudbox have tools for it. Mesh Mixer allows you to actually paint resolution if you need to do that. Wrap3 is good at taking model A and projecting it to model B. 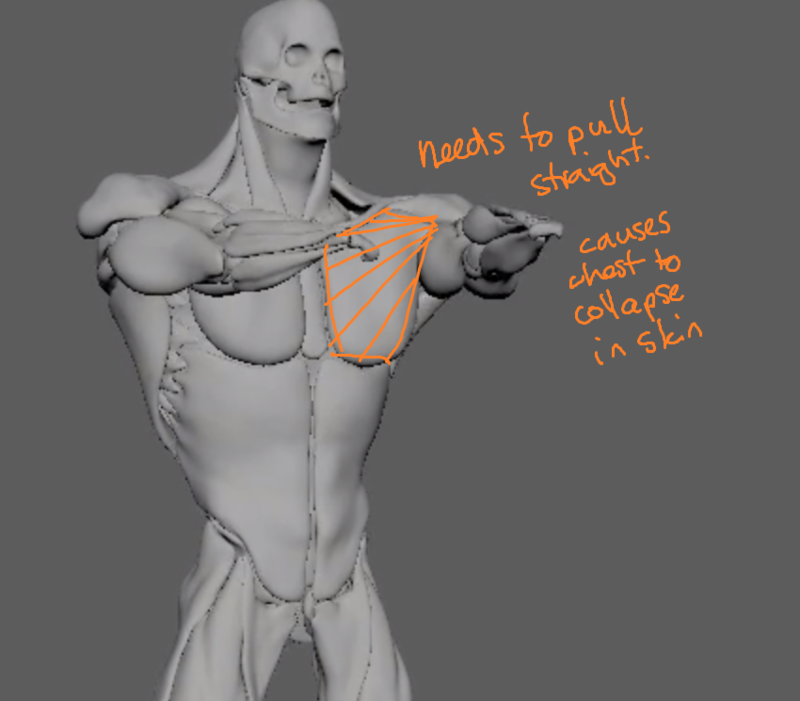 You shouldn't need to retopologize the muscles, just move (warp) them. Could you get away with just a basic facial rig? andy_vs Great advice again, thnx! A basic facial rig would do and it would probably not be that much of a problem for me as I initially expressed. It looks like it will be a while before that mocap shoot, so I decided to put the work I already did on Mr Ink to some use today. It was fun retargeting with Ikinema for the first time and figuring out how to do slow motion in Ziva. I'll definitely work some more on this and look at some proper reference for the interaction. I was wondering if it would be a bad idea to simulate the chain in Ziva as well so it knows the bag's weight and the force applied to it? Yeah you could definitely simulate the chain. Would probably do it with a proxy mesh and embed the chain links. Could try simming the actual links though, each one being a stiff tissue. Might need a lot of substeps to catch all the collisions between the chain links. I updated the sim today as well, I think I overshot a bit and made the fat layer look too much like goo. Hey, yes it would make them deform actually. Another thing I was thinking about was potentially making each chain link a tissue with quite a high youngs modulus. You could make the tet size quite large so it's just one or two tets for each link. Then constrain each link with an attachment from one vertex (maybe two), probably from the inside of the mesh. This should allow the attachment to pivot. Then also add collisions. Might work, worth a shot!